So it’s March in Western Montana, which to me is one of the longest stretches of depressing weather one can expect during the year. If you live in a valley like I do, you might find yourself bargaining with the weather gods for either a sunny day, or a good, solid snowstorm that doesn’t convert itself to ice in a day or two. Well, if you’re tired of waiting out the avalanche warnings, staring at the sky, which you no longer believe to be truly blue, or you’re ready to lock your kids/dog/spouse in a closet because your backyard /school playground/ park/ trail has become a muddy ice pit, why don’t you mix it up and try an ice fishing outing? I’m just going to put it out there and let you know that ice fishing is not one of my regular activity choices. I get cold easily and occasionally wonder about the point of staring at a hole in the ice in often miserable conditions. 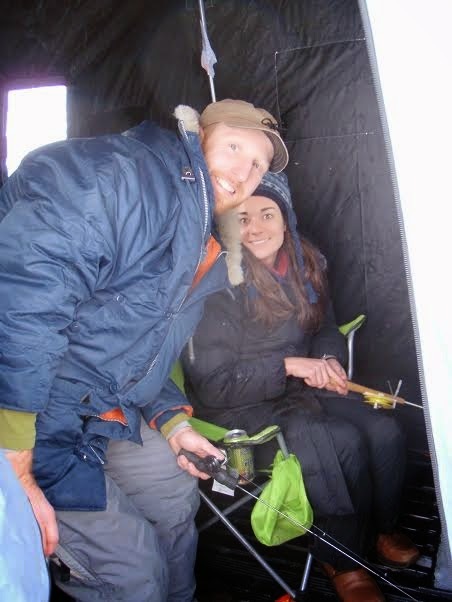 However, I come from an ice angling cultural background and also married into a fishing-obsessed family, so I’ve decided to embrace it and to share my eight best tips of ice fishing enjoyment (or tolerance) with all of you. I tried to think of ten tips, but I guess eight is good enough. 1. Make everything a competition. Yeah, that’s right. Forget all you've heard about everyone being a winner. Any kindergartner can tell you that that’s just not true. Either you’re a winner, or you’re a loser. It’s that simple. If I've learned nothing else from my in-laws, it’s that every activity should test something (mettle, strength, stamina, mental endurance) which makes ice fishing the perfect arena for all of the above. Can you auger a hole faster than your partner? Did you catch the biggest fish, the first fish, the last fish, the most fish? Did you win all of those at the same time? Can you sit on Georgetown Lake with your face in the wind longer than any of those other yahoos who wimped out and brought huts? I think you see where this is going. Anyway, even if you don’t win, you may be a loser, but you forgot about your frozen extremities, right? 2. Don’t diss the hut. My husband’s family acquired a hut a couple of years ago, and they were too embarrassed to use it until this year, when I insisted. Those yahoos bring huts for a reason.. If you don’t own a hut , make friends with someone who does. Then, even on a blizzard day, you can make sure that the whiners among your family and friends who are spoiling your endurance sport are tucked safely away out of sight and earshot while you commune with nature and your ice sieve. Bonus- you still get credit for taking them somewhere besides a movie theater and for providing them with memory-forming fodder. 3. Get yourself a Coleman. Ok, I understand that you love your Dragonfly or your JetBoil, but will it cook a brat and boil a pot of water at the same time? I’d like to see that happen. I’d also like to see you keep your backpacking stove and pot of water upright and boiling while surrounded by multiple dogs and children. Not likely. My husband bought our Coleman at a garage sale for five dollars (the asking price was ten--just so you know that he bought a quality product), and it is one of my favorite investments. Do yourself a favor and get one. I’m even giving you permission to skip the REI trip or the pro-deal and buy it somewhere else--like Goodwill. 4. Make yourself—or your fellow fisherpeople—useful. I can tell you’re already shaking your head and thinking, “this ice fishing stuff sounds pretty boring.” You’re imaging the kids whining because they don’t have their iPads or that you’ll be whining because you could be playing Candy Crush, but you’re afraid that you might drop your phone out of your frozen fingers and into your ice hole. First of all, leave the electronics at home. They’ll still be there when you get back. Well actually, a phone is fine. You need to take photos for bragging purposes, and if someone falls through the ice, you might want it for an emergency call. Anyway, second point, nobody likes an idle whiner (or any kind of whiner for that matter). If you’re tired of jigging, give yourself, or someone else, a job. Try being the photographer. 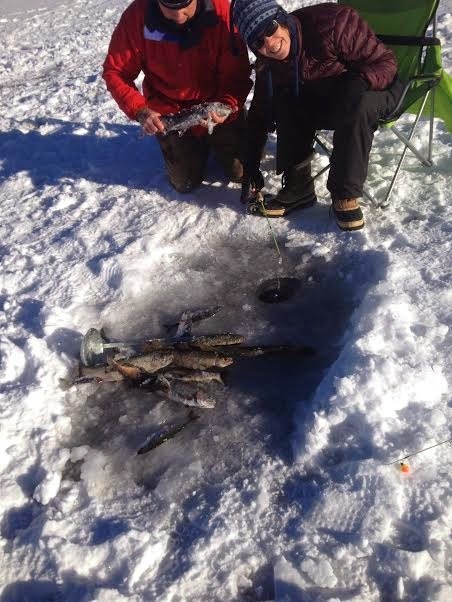 Everyone likes getting a picture next to his or herhuge pile of kokanee. You can even give them useful tips about fish placement or fish-holding style for maximum size appearance. You can also be “that guy”, you know, the one who wanders around the lake checking on the other anglers and asking nosy questions about fish numbers and types. This is useful to the rest of your posse because it distracts the other camps from their jigging and gives your family better chances. Plus, next time, you can steal a better spot. If the problem isn’t you, you can always put fair-sized children to work auguring more holes for when you get tired of your own. Encourage this by referring to Tip #1. 5. Bring supplemental entertainment. “But wait,” you say. “I thought you just said to leave all that stuff at home!” Well, I did, but that doesn’t mean you can bring a pair of cross-country skis and a fair quantity of alcohol, as did our forefathers. Like I mentioned at the beginning, I get cold quickly and also lose all feeling in my fingers, which greatly inhibits maggot placement on my hook. It also inhibits any feeling of wellbeing that I might have had at the beginning of the adventure. When the deep freeze settles, I know it’s time, for everyone’s sake, to get out my skis and take a tour of the lake. In addition to health benefits of the exercise, anyone can do it, and it’s much easier and more efficient to be “that guy” (Tip #5), not to mention sneakier. As for the alcohol, I’m not really going to endorse it, but I’ll just assume most of you have experienced its fun/warmth enhancing properties before. The kids are kind of out of luck with this scenario, but they can tough it out and have maggot-eating contests or make snow angels. Plus, now you have that Coleman for hot chocolate. 6. Perfect your technique--by stealing from others. No one wants to sit on the ice all day with no results. Frankly, it’s just embarrassing. So listen to your elders when they give you angling tips. Feel free to make fun of them while they offer this advice, but store it away anyway, and use it when you think they’re not looking. Maybe lifting your rod way over your head and then slowly letting the lure sink down really works, but just don’t give them the satisfaction of being right. If they say that you should cover all parts of your hook with wiggling maggots, scoff, but later discretely check your own hook to make sure that this is the case. Then, when you catch a big pile of fish, you can just laugh and point to your own expertise. 7. Stockpile stories to improve your coolness factor. Do you have a boss who loves to tell you outdoorsy stories? Do you have family in warmer parts of the country that you need to impress with your newfound Western toughness? Are your kids lacking in “uphill both ways” experiences with which to bore their future children? Well, a few days out on the ice might fix that for you. 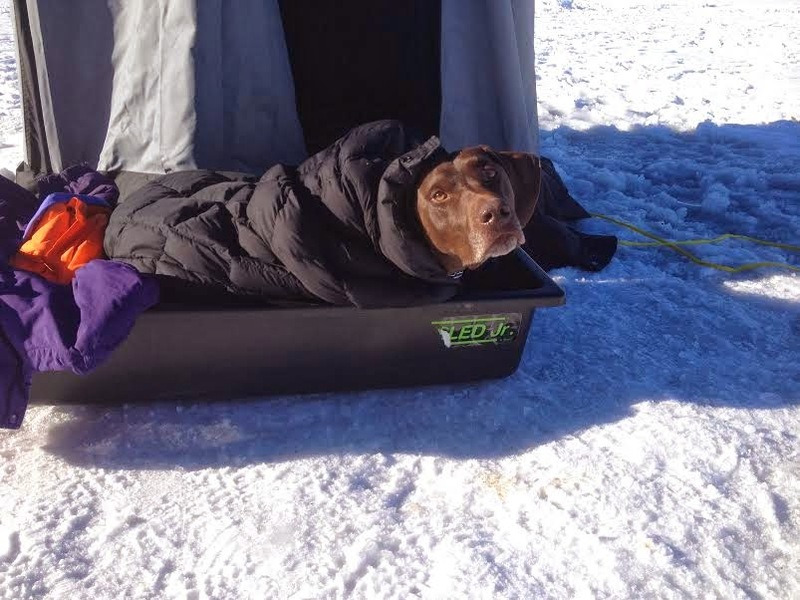 When you tell coworkers that you sat out on the lake all day with no shelter in five-degree temperatures, they might look at you like you’ve lost your mind, but underneath they’re really thinking, “How cool is that chick/dude.” Ice fishing stories are always epic and exciting for others. Don’t let your audience pretend otherwise. They’re just jealous. 8. Always have a good exit strategy. I’m not going to lie. Some days on the ice simply aren’t worth it. Maybe you’re just not feeling it, or the fish aren’t biting, or your collapsible hut is just way too confusing to put together. I hear you. However, don’t look like a weenie in front of the other people on the lake, your buddies, or your kids. Surely you have any number of important things waiting for you back home, like film festivals or fund-raising dinners. Maybe you have animals to feed or think you may have left the gas range on. If you’re really unimaginative (or just not busy enough), you can always “accidently” drop all your maggots down the hole or put your synthetic mittens on the hot Coleman. Those are always pretty solid game-enders. By having any number of escape tactics, you can leave with your pride still semi-intact (what kind of idiot drops all the maggots down the hole? ), and you don’t look like a quitter. So go ahead, gather up the rods, dogs, kids, snacks, Old Crow, and your hut, and hit the road with your head held high for a job well done. I hope you find these tips useful and inspiring for your future angling endeavors. Spring will be here soon (three or four months goes by so fast! ), so get out there and catch some fish while you still can. Have a fantastic and safe rest of your Montana winter.